Okay, so I can finally confirm that I will be attending the Lakes International Comic Art Festival next month (17-19th October). This will be my first comic event appearance in an official capacity in a couple of years or so, and I will be signing copies of Meanwhile...#1 at the Soaring Penguin table in the Comics Clock Tower at certain times over the weekend. I expect there'll also be copies of the three Strangehaven trade paperbacks for sale. I may even have some original art with me, but Kendal is a long train ride from Leigh-on-Sea, so it might depend on how my shoulder's feeling the morning of travel. 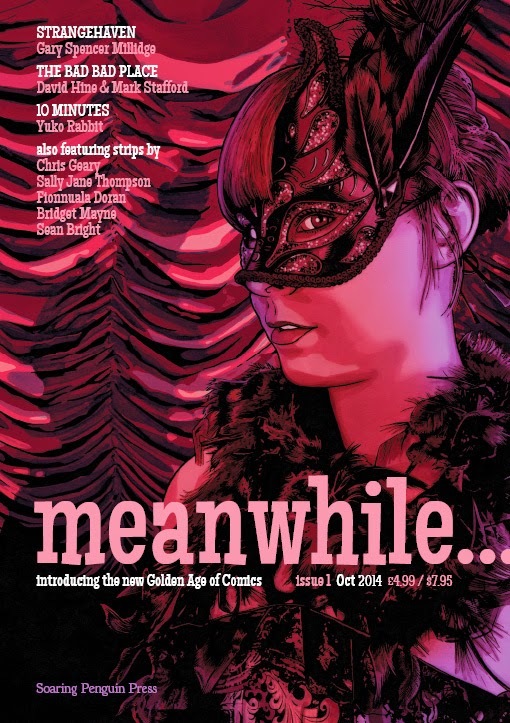 I was invited by Bryan Talbot during its inaugural event last year, but it seemed like a waste with nothing to promote, but the timing couldn't be more perfect this year, with the launch of the new Meanwhile...and all of its Strangehaven goodness therein. 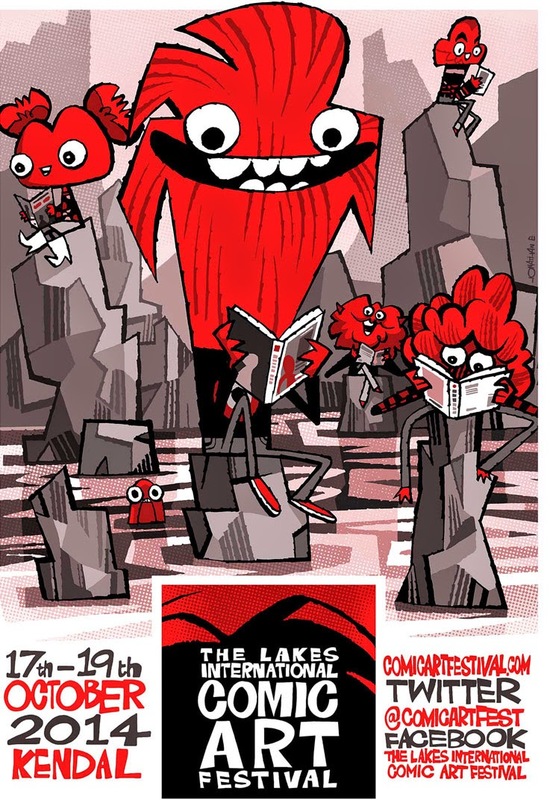 The Lakes has announced a really diverse and eclectic mix of guests including Jeff Smith, Scott McCloud and Joost Swarte, and I'm really looking forward to seeing how it matches up to its rapidly growing reputation. Well now, let’s see, it may have been quite some time since I've written a blog post, but in my defence, I suspect that most people reading this would rather I be doing something like drawing the next episode of Strangehaven, as opposed to blogging about the last film I saw or my problems with my air conditioning unit. But it appears that my hand has been forced by the not totally unexpected, yet still surprising (to me at least) appearance of Meanwhile…#1 on the Soaring Penguin Press website yesterday. If this is what’s called being ‘in the loop,’ then I do hope I never fall out of it. Just to recap, in case you haven’t been paying attention, Strangehaven is returning in all-new stories as part of a new (technically revived) ongoing British anthology book called Meanwhile… (complete with those three little dots at the end). It was originally announced for publication in May, but, for numerous reasons, almost all entirely my fault I'm sure, the first issue has been bumped to this autumn. It says October on the tiny little cover repro, and we’re supposed to be doing some fancy launch at the Lakes International Comic Art Festival (17-19th October 2014) assuming it arrives back from the printer in Latveria in time. So yes folks, it looks like it’s really happening. You can pre-order it on the aforementioned Soaring Penguin Press website, and I am confidently predicting that it will be available from all the very best British comic retailers in the subsequent period. I have no idea what form of distribution Meanwhile… will enjoy in the US or the rest of the world at this stage, so please direct all enquiries to the publisher. It’s sort of odd not being in charge of that sort of thing, let alone not even knowing anything about it, but without Soaring Penguin’s support, Strangehaven would still be some way off any kind of publication. So, be grateful for small mercies. Anyway, I don’t know exactly what I'm at liberty to say about it, other than what’s on the website, but it will be a 52-page ‘golden-age’ format comic book (i.e. a bit wider than your usual comic), containing a mixture of colour and black and white strips. There’s a sixteen page episode of Strangehaven which follows on from issue 18 of the regular series (or from the end of Conspiracies if you've followed the series in collected form), as well as a new continuing series from the excellent team who brought you The Man Who Laughs, David Hine and Mark Stafford. There are also contributions from Chris Geary, Yuko Rabbit and Sally Jane Thompson. As a bonus, there are all three winning single-page strips from the 2014 British Library and Arts Thread Comics Unmasked Competition. Oh, and that’s a Millidge cover right there. If I get the time and permission, I might try to post a few more previews of the book, but seriously, if you haven’t heard enough to want to order it by now…dude! I mean, come on! One more thing while I remember, any former Strangehaven subscribers who haven’t responded to my letter or email about transferring or refunding their subscription balance, really need to contact me as soon as possible. You guys have probably moved house and/or email address since I last published and forgotten all about it, so get to it, guys!